You all enjoyed our last giveaway so much, guess what - we're having another one! Yippee! 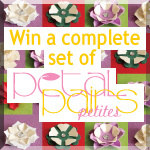 This time one lucky winner will be receiving a complete set of our Petal Pairs Petites Punches. If you've not come across our Petal Pair series of punches yet, you are in for a treat. Each adorable Petal Pair can be interlocked with another creating a whole array of perfect floral embellishments for your cards, scrapbooking and other papercrafting projects. 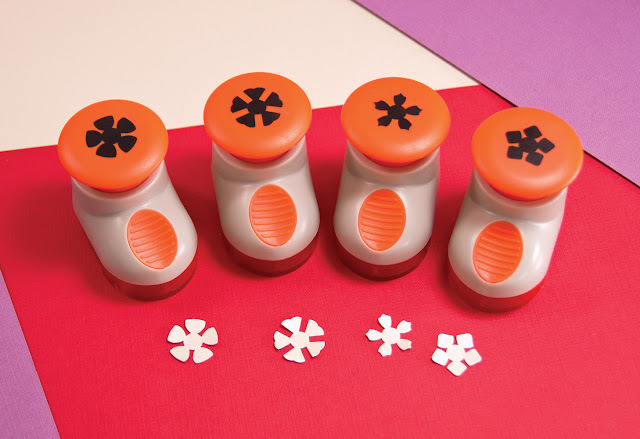 If you already own a set of Petal Pairs, you will find these Petite punches a delightful addition to your collection. The prize will be drawn at noon on the 15th of March. The giveaway is open to all followers in the UK and Europe. If you don't yet follow our blog then please join us either on Google Connect or Networked blogs. 1. For one entry, please leave a comment on this post telling us what your favourite flower is. 2. For a second entry, blog about our giveaway, or post a link to it in your sidebar and come back here and leave a comment letting us know where to find it. Here's an image you can use... or you can copy and paste the HTML code into your sidebar if you like. Sorry, this Giveaway is now closed, but if you would like to be the among the first to hear about any New Giveaways, then please join us on our Facebook Page.